Trump has demanded an apology from little ol’ Supreme Court Justice Ruth Bader Ginsberg. 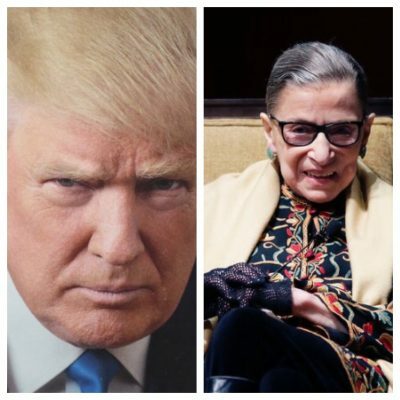 “Is Ruth Bader Ginsberg [a frail, 84-year-old woman who spends her free time knitting and listening to opera] going to apologize to me for her misconduct?” Trump asked in a Tweet sent out yesterday. At press time Mr. Trump, who has likewise pledged to bring both Vladamir Putin and China to heel, was attacking a second grandmother on Twitter for pointing out actual things he has said in the past. J Crock is a veteran newsman with over 50 years experience who doesn't understand why his serious attempts at reporting the news keep winding up on the comedy section of this publication. He spends his days imploring the editors to cease making a mockery of his craft, his nights filled with rage and one day very soon, he will have his revenge. Oh, yes… he'll have his revenge. Listen in: The Donald Woos VP Choices Just Prior to Announcing!